A video of my head was made as I rotated on a stand with a camera recording from a fixed tripod position. 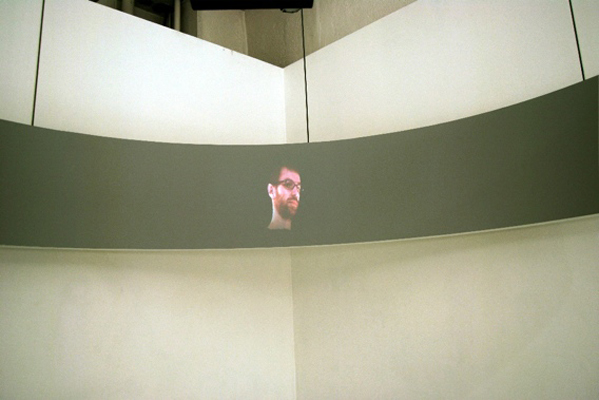 The angle of the camera was determined so that the viewer of this piece would be positioned in the center of this installation, viewing my image at the same angle that the camera recorded it. As the video was made, I held eye contact with the camera for as long as I was able to hold it during each rotation. With the viewer positioned in the same relationship to the image as the camera, the eye contact is transferred to the viewer. 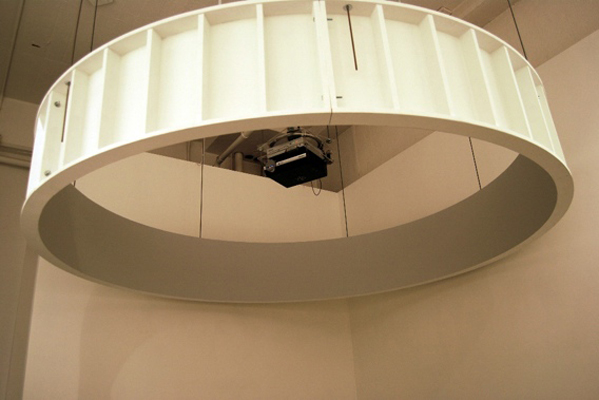 A suspended video projector is mounted in the center of the screen installation. The projector and DVD player are mounted below a motor which continuously rotates, causing the image to continuously move around the screen. The effect is that image of my head is both rotating on an axis and is as well in orbit around the viewer.